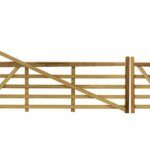 All the field gates measurements are for individual leaves and prices do not include posts, accessories or fastners except where specified. For posts, accessories and fastners please click on “related products” or navigate to specialist sections of the site. For timber gates, left or right handed refers to the side the gate is to be hinged when viewed from the front. Gate bracing is to the front side. Galvanised steel gates available in various sizes from 3ft through to 12ft. Field gates come in all shapes and sizes. 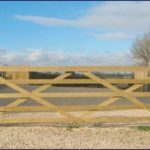 We have basic, hard wearing gates suitable for use on farms through to more decorative field gates that might be better suited to driveways or domestic property located in rural settings. We offer both timber and metal field gates in a full range of sizes. Standard Five Bar Timber Farm Gates. We have a number of different styles and types of wooden field gates for sale. At the basic entry level we have timber 5 bar field gates that are ideal for use in a multitude of settings. These farm gates are built from planed, tanalised pressure treated timber to ensure a smooth finish and a durable life span. Our standard five bar field gates come in both left hand and right handed options (identifiable by the fixings bolts). Our standard sizes (always in stock) are 3ft, 4ft, 5ft, 6ft, 7ft, 8ft, 9ft, 10ft, 11ft and 12ft. With our range of size options you can create double field gate openings that are suitable for machinery or you can opt for a pedestrian access and vehicular access set up. Whichever set-up you go for we have all the field gate posts and field gate furniture you need to suit your gates. Our timber estate gates or horned field gates come in both a hardwood or softwood option. The softwood option is created from planed tanalised timber for durability. This type of gate is ideal if you are looking for something that is traditional but offers a little more decoration than normal. Like our five bar gates, the estate gates are are available in right hand and left hand options and come in all the same sizes allowing you to configure your set of gates in a variety of ways. With the field gate fittings we can supply these gates can be mounted to brick pillars or on timber posts. The Estate gates are a special order gate, once orderd we are unable to offer any exchange or refund on these gates. Our galvanised metal field gates offer the best value in our range. Our steel farm gates come in slightly cheaper than our basic five bar field gate. Our steel farm field gates are a seven bar pattern complete with three vertical bars for rigidity. They are a channel end frame configuration rather than a box section frame. The channel frame is ideal if you are fitting the gate to existing posts as the eye bolt slot is elongated for adjustment (a box frame offers no adjustment arrangement). Our steel field gates come complete with hanging eye bolts and locking shoot bolt so you don’t have to pay for extra gate furniture. All our field gates are galvanised for durability. We offer 3ft through to 12ft size options, in stock year round.